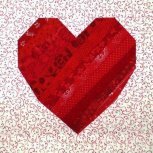 Free Sewing & Quilting Project Tutorials & Tips for You! Is your 1/4" seam allowance really a 1/4"? Follow our easy instructions and find out! A little help from our quilting staff for you to keep on hand! Which Batting Should I Use? Crafty Chris researched this question for a Creative U seminar and compiled great information for you! Jelly Roll Race Quilt with a 12! Here's our version of the Jelly Roll Race Quilt you've seen all over the internet. Just one Jelly Roll, 2 Strips Packs or cut your own. In case you're making a "Seahawks" version, we've added a number 12 you can applique in the corner! GO Hawks! Designed by Andrea from our Web Store team. A fabulous runner for any striped fabric! Designed by Bellevue's Nancy Spornitz for our Shabby Chic Garden Rose collection from P & B Textiles. A beautiful quilt full of cozy charm! Made from the charming BFF collection from Elizabeth Studios, this darling quilt is the perfect setting for the sweet sepia-tone illustrations. Designed for us by Nancy Spornitz of our Bellevue store. Plush, easy and totally cozy. 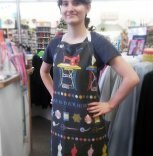 You'll love this fun quilt designed by Anna-Beth from our Northgate store. Be sure to download the Cuddle Sewing Tips sheet below, too! Whether it's your first zip or you just need more information, this Zipper Advisor from our friends at Coats will be a good friend! Making your own Double Gauze swaddle is easy and you can choose any color or print you want! Our instructions include how to swaddle your sweet baby courtesy of our friends at Shannon Fabrics. Polyurethane Laminate is perfect for sewing diapers, bibs and more. Here's everything you need to know from our friends at Babyville Boutique! Not sure of the fiber content of that gorgeous fabric in your stash? Try this simple burn test to get a better idea of what you're working with. Please be sure to follow our cautions as you are testing! The coated fabrics available today are rich, lucious and fun to sew - if you know how! Print our our tips and keep them close by as you work on your project. Written with Halloween costumes in mind, you'll find tips and hints for every day of the year in this handy guide. Make a decorative pillowcase with fun novelty fabrics using the burrito method. It's fast, easy and fun! This project is so easy you'll practically be done before you start! Try using fanciful quilting cottons for a themed look or rich silk dupioni for an elegant bottle presentation. Make one for yourself and another to wrap a special gift for your friend! You've found the perfect gift and now you need the perfect wrap? These re-useable fabric gift bags are just right for all occasions! Here's a fun way to make a comfy fleece throw. Get a friend involved and you'll be done in no time! A cute scarf with fluffy yarn fringe. Adorable in solids, stripes, dots or prints with coordinating or contrasting yarn! You can turn alomost any pull-on children's pants pattern into sturdy, fun reversible pants with our easy directions. 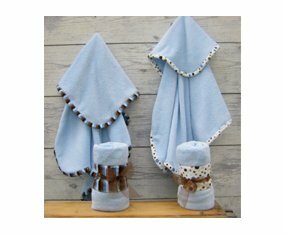 A few tips and things to consider when making nursery decor and children's clothing. Fun how-tos for easy, projects your favorite little princess will love to wear! Can you stand the cuteness? Simple stitching and minimal stuffing pulls this project together in a flash. Select three of your fav fabrics — we couldn't stop at just one — and add a dash of hook-and-loop tape to help him hang. 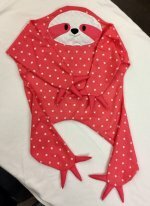 Sew up a sweet sloth (or several!) for someone you love! This is a quick and easy baby blanket Free Pattern from Shannon Fabrics.